One of the perks of living in Miami is the sun, sand and surf. But where do you go to get away from it all when you live in a palm-tree lined paradise like Miami? Only an hour’s drive south you’ll find the fabulous Florida Keys, a world apart from the fast pace of big city life. The beaches, diving and fishing in the Keys are among the best in the world. Read on for an overview and background of the islands. If you haven't been there yet, you're missing out so hop in the car, pack some sunblock and get moving! The Florida Keys got its name from the Spanish word cayo, or island. Ponce de Leon discovered the Keys in 1513, but it was not settled for hundreds of years. The islands were left to pirates. The native tribes of Calusa Indians died out in the 1800s as Spanish settlers came to the area with agricultural business; Key limes, pineapples and other tropical fruits were the first exports. Traveling to the Keys, you’ll drive through Homestead and Florida City until you reach an 18-mile stretch of US1 through the Everglades, known to locals simply as "The Stretch." There's no way to go but south. In most parts, the road is simply a two-lane highway, which means you may get stuck behind the occasional slow-moving boat trailer. Be patient, as there are passing zones that widen to four lanes every couple miles. The ride is quiet and serene, which puts you in the vacation state of mind you’ll need for a weekend in paradise. Take it easy, put your favorite playlist on and lower the windows so you can get some of that fresh, healing sea breeze. The first key you’ll reach is Key Largo. Some of the best diving in the Keys is found at John Pennekamp Coral Reef State Park, the beginning of the only living coral reef in the US. Diving, snorkeling and glass-bottom boat rides allow for spectacular views of undersea life. This includes the Christ of the Abyss statue, a bronze Christ with his arms raised up toward the sun. At only 25 feet below the surface, it can easily be enjoyed by snorkelers as well as divers. The next major key, after Tavernier — where you'll find some great restaurants (Old Tavernier and Chad's) as well as the Tavernier Creek Marina — is Islamorada. Islamorada is known as the Sport Fishing Capital of the World. A variety of game fish such as marlin, tuna and dolphin abound in the crystal blue waters. Take any one of the many charter boats to be found every couple of feet and be off for a day of fishing. If you’re not a fisherman, see a show or swim with dolphins, stingrays and sea lions at Theater of the Sea. Grab a sunset cocktail at Morada Bay; also, be sure to check the waterfront restaurant's calendar of events online in case your visit coincides with the monthly Full Moon Party that includes live music and a show. Marathon, known as the Heart of the Keys, is a small town smack dab in the middle of more prominent islands. If you’re driving through, be sure to stop at the Wal-Mart or Home Depot for anything you forgot; you won’t get another chance while you’re in the Keys! The seven-mile bridge, which has been the site of several movies including True Lies, is a gorgeous ride over the water toward Key West. On one side is the Atlantic Ocean; on the other, the Bay. When the sky is clear blue and the sun is shining, it’s an unbeatable landscape of colors. After Marathon comes a chain of small islands known collectively as the Lower Keys. They include, among others, the unparalleled diving at Looe Key Reef within the Florida Keys National Marine Sanctuary and the pet-friendly beaches of Little Duck Key. Homey restaurants make the Lower Keys a perfect place to stopover for dinner. 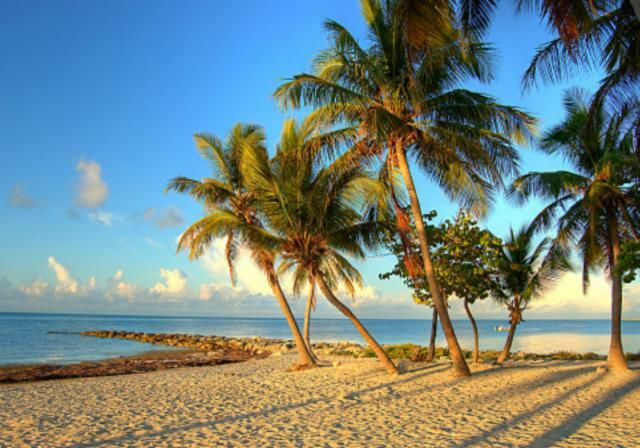 Key West, the southernmost Key, is unlike the rest of the Keys in the best possible way. The marker at the southernmost point in the US is 90 miles from Cuba, and on a clear day you can make out the shape of Cuba on the horizon. Hemingway found Key West an inspirational place to work, and it has continued to draw artists and authors from around the world to this day. Nightlife can be a bit wild, but it’s all part of the charm and includes live music at every turn. Don’t miss the sunset at Mallory Square; the nightly Sunset Celebration, that includes jugglers and other artists, is inspiring. Around the corner is El Meson de Pepe, where you can dine on Cuban sandwiches and wash it all down with a classic daiquiri or mojito. Catch the Latin band here every night, the only one like it in all of Key West. The Keys are right around the corner, yet still a magical world away. Head down for a perfect weekend getaway filled with relaxation, culture and the freshest fish in the country. It'll be a weekend you won't soon forget.